The 5 factor diet gives your body a healthy home run with low-gi foods and high quality proteins to match an easy to manage weight loss program that promises to keep the pounds off. The 5 factor diet made famous by celebs like Lady Gaga and Jessica Simpson, takes dieting to a new level of simplicity. With sound guidelines for losing weight all you need to succeed is keeping in mind the number five. More importantly, if you want to lose 12 pounds in a month this diet may be right for you. Serial dieters know how tough it is to go on a diet just to put the weight back on. No more unreasonable dietary restrictions, just a sound plan to lose weight and keep it off. The 5 factor diet is a weight loss program built around the number five. That means spreading out your daily intake into 5 meals, with certain exceptions implied. With simple rules for eating and exercise, it is just what serial dieters need to guide their weight loss. Eating 5 meals a day you may be wondering what is the best way to time your meals. Going with your intuition, you may just want to add a meal between meals and eat less during breakfast, lunch, and dinner. In fact what is best depends on you. Determine the how to match you eating habits to fit your lifestyle and you are golden. What is the best time to eat on the five factor diet? Although what time you eat solely depends on your schedule, give yourself 3 to 4 hours between meals, eating 5 meals a day, while avoiding eating too late in the day. Here is an example of how you should schedule your meals giving yourself of five. Just because you were told 5 meals, doesn't mean it would be good as long as your eat five times a day. What you are going to need to do is balance what you eat into 5 sittings while considering the following rules into each meal. Fruits count too!? - There is more to carbs than rice and bread. Don't forget to add in beans, vegetables, and fruits into the mix. 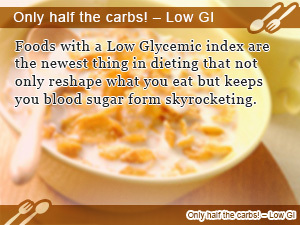 Make have you meal carbs while taking in low-gi foods keeping your blood sugar level from shooting up too high. Eating red meats, fish, and egg whites are recommended as low fat high protein foods. Incorporate high-fiber foods such as beans, fruits, and vegetables that not only give you the right amount of ruffage but have carbs that hits two birds with one stone for your diet. Eating the skin of fruits and vegetables contain tons of fiber, which is one reason to avoid scrappage. Extra virgin olive oil contains oleic acid, essential fatty acids, and polyphenols which is no mystery why it is the choice in oil for so many heath addicts. For a good source of unsaturated fatty acids sesame oil and canola oil are recommended. Drink enough low calorie drinks such as water and tea. Avoid adding to much sugar when drinking coffee and black tea. Exercise 5 days a week with each workout lasting between 20 and 30 minutes. That gives you two days a week to take a load off and do something not having to do with your diet. Instead of using the escalator use the stairs. Walt to the station instead of using the bus … Find new ways to turn exercise into something you don't have to think about and just do like going throw motions during the day. This is how do-nothing and still lose weight diets are build. Make exercise as seamless as getting dressed in the morning. The five factor diet makes it possible to start dieting from day one and still be able to appreciate a days off like you are used to. This is advantageous because it gives you a day to deal with stress unlike other diets that seem so Spartan you may want to quit. A day to liberate stress from dieting gives you a chance to eat the foods you want without feeling guilty. Five reasons why the 5 factor diet works!! No more waiting 6-7 hours before your next meal like you would eating 3 meals a day. By eating 5 meals a day, you decrease the amount of time you spend waiting for you next meal making you less hungry throughout the day. The longer you spend in the hungry line, the more likely you are to overheat. By shortening the period that you spend waiting for you next meal, you feel less hungry throughout the day, making it easy to fight off the urge to pig out. By eating less per sitting incorporating low-gi foods helps keep your blood sugar down. When you flood sugar level increases, insulin gets send out throughout your body causing fat to be stored away at alarming rates. That is why eating low-gi foods and smaller portions can keep you from putting on fat. The five factor diet is a breath of fresh air giving you 1 day a week to think it up and realize that you are going places with your diet. What is most important in dieting is sticking with the program. That is why a diet with less stress can stretch to get results. Just by following the 5 rules to eating you can naturally lower calories to start slimming down healthier. Compared to diets that focus too much on calorie counting, the 5 factor diet with balanced nutrition comes with many merits to keep your metabolism running strong. In order to get the most out of the five factor diet you need to pay special attention when choosing what foods to eat. Here are a few foods that you diet shouldn't be without to get things started. Many foods made with soy beans are high protein, low fat, and an excellent source of dietary fiber. For example, consider soy milk. Soy milk has a great balance between carbs and protein minus the fat, which is exactly why people consider it such a good substitute for milk. It's just only one food that is going to help you pass the 5 rule test. Discussed above, the five factor diet requires you to get half your calories from carbohydrates. Carbs increase you blood sugar. That's why you it's to choose low-gi foods into your diet. How you blood sugar is affect by the foods you eat has to do with something called the Glycemic index (GI). The GI of a certain food is a measure of relative rate your blood sugar will raise after eating. A good rule of thumb is that foods with low-gi are best. Proteins are made up of amino acids that get broken down when they come in and get assembled into something more useful to your body. There is such a thing as good protein. 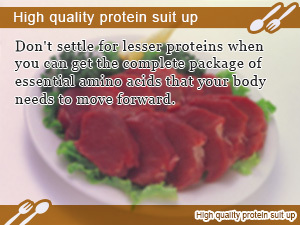 Good protein comes with a complete balance of essential amino acids. How do I get the protein my body needs minus the fat? Compared to vegetarian products, animal products have a better balance of amino acids. Although if all you are worried about is getting enough protein, animal protein gives you what you need. Here is an example just to show how fat composition changes even when considering the same product. Let's look at how skinless chicken breast differs from normal chicken breast. Choosing foods that are low in fat is so important that sometimes all you need to do is remove some skin to take in dramatically less amount of fat. This done throughout meals during the day adds up at the end of the day. So keep in mind ways to trim down without having to change what you eat. 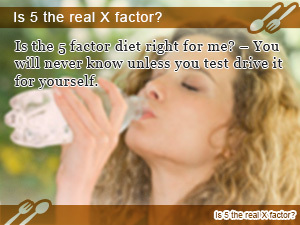 Is 5 the real X factor? Is the 5 factor diet right for me? – You will never know unless you test drive it for yourself. Foods with a Low Glycemic index are the newest thing in dieting that not only reshape what you eat but keeps you blood sugar form skyrocketing. Don't settle for lesser proteins when you can get the complete package of essential amino acids that your body needs to move forward.